pharmacy online canadian pharmacy Food, Food, Food : A KL-ite weekend in Penang – Day 2 – The Kueh Hunt & Heritage Hotels | Penang Street Food | Penang Delicacies "penang food", "penang hawker food", "penang street food", "penang delicacies", "penang gourmet", "food in penang"
This Nyonya kueh “manufacturer” operates from a really traditional shop on Jalan Mesjid an unassuming nook off Chulia Street. 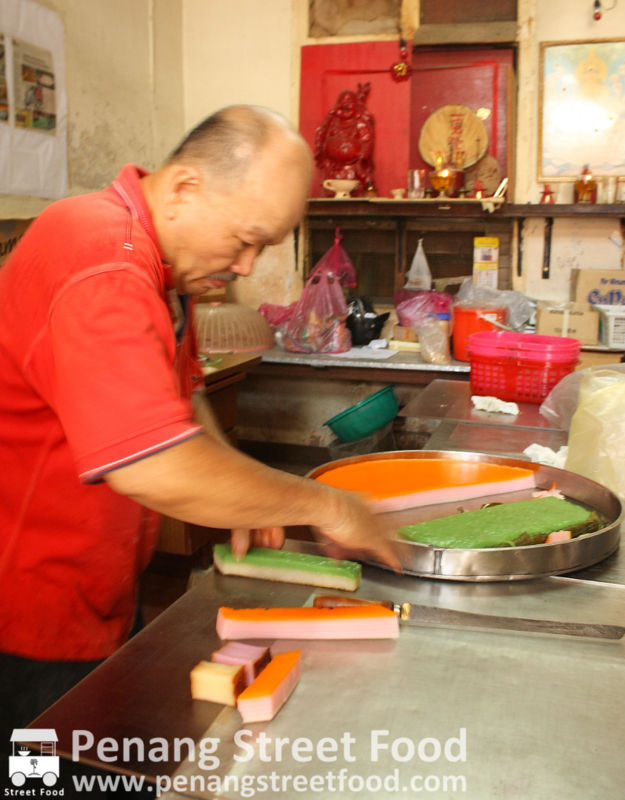 Mr. Mook Hian Beng makes all varieties of Nyonya kueh and supplies kueh sellers around Penang island and some hotels, but he welcomes walk-in customers as well. Walking into the shop that opens directly into his kitchen filled with large copper pots, woks and all sorts of implements to make Nyonya kueh, it seems as though you have stepped back in time. When queried about this mystery yellow-coloured, diamond-shaped kueh topped with brown sugar syrup that my friend was craving for, Mr. Mook sadly confirmed that he doesn’t make this. Apparently, it is not such a common find nowadays. 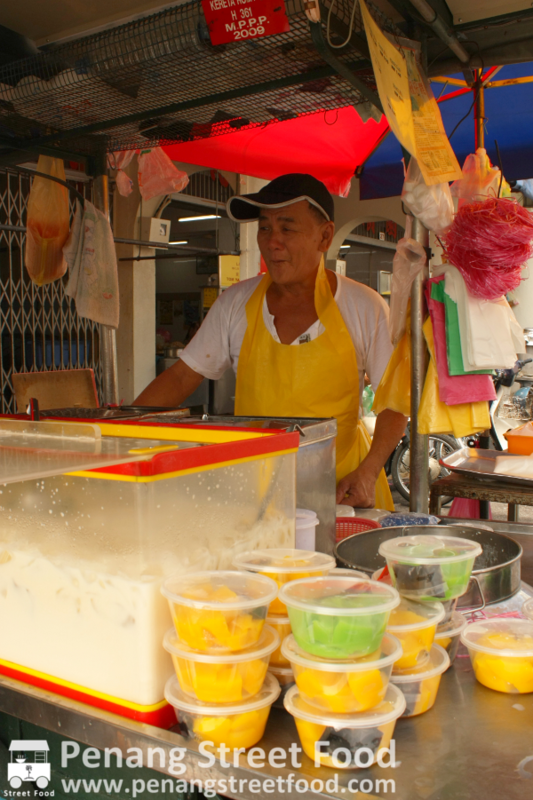 But he did give us its name….Ki Ya kueh; and a possible location and vendor to lookout for…a soybean milk vendor outside Chowrasta market! Since we were already on premises, Mr. Mook tempted us with an array of colourful kueh that we found hard to resist. So we picked an assortment of what was on offer that day. He promptly pulled out the large round trays and sliced up the goodies in front of us. 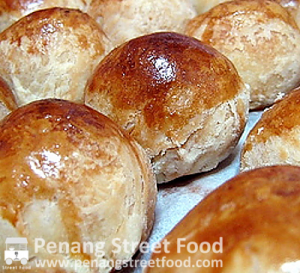 The purple – Kueh Bengka made from yam and baked to form a brown crusty edges. The light yellow – Kueh Bengka made from tapioca also baked as noted from the brown crusty edges. The pinkish, orange – Kueh Lapis (Nine Layered Kueh) which is painstakingly made layer-upon-layer alternating between white and pink and topped with an orange layer. I love to make this kueh last longer by peeling and eating it a layer at a time. 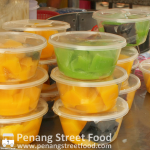 The green and white – Kueh Serimuka (not to be confused with Kueh Talam). This two-layer kueh is made with glutinuous rice at the bottom and a green pandan jelly-like top. We left happily with our tasty treats to continue the kueh hunt. 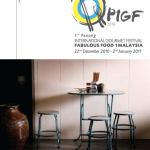 For catering enquiries, Mr. Mook can be contacted at +604-261 5832/ 826 2632 or on mobile at +6012 415 2677. The enterprising kueh maker has even ventured into the pizza business offering Malaysian style pizzas with curry chicken toppings! A logical spin off from his curry puff offerings, of course. 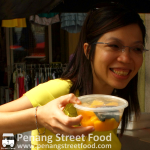 As we were only a stone’s throw away from Yeng Keng Hotel, which Ms. Purple Hat had read about recently in the Edge Financial Daily about a RM3 million makeover, we walked from Mr. Mook’s kueh shop past Sky Hotel Cafe. 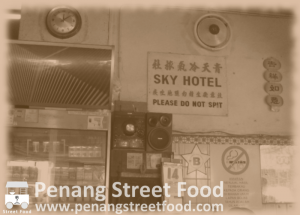 Sky Hotel Cafe is a throw back to the typical 1950s coffee shop and is famous for its hawker selling all manner of roast meats. The snaking queue during lunch hour was a testament to its excellent roast pork. Ignoring the roast pork temptation, we made our way around the corner to check out the ambiance at this newly refurbished heritage hotel. Fortunately for us, Jacky the hotel manager was in house to give us a courtesy tour of the premises. The twenty room heritage hotel was a former “rent by the hour” establishment, but is now a very respectable boutique hotel with its colourful history behind it. 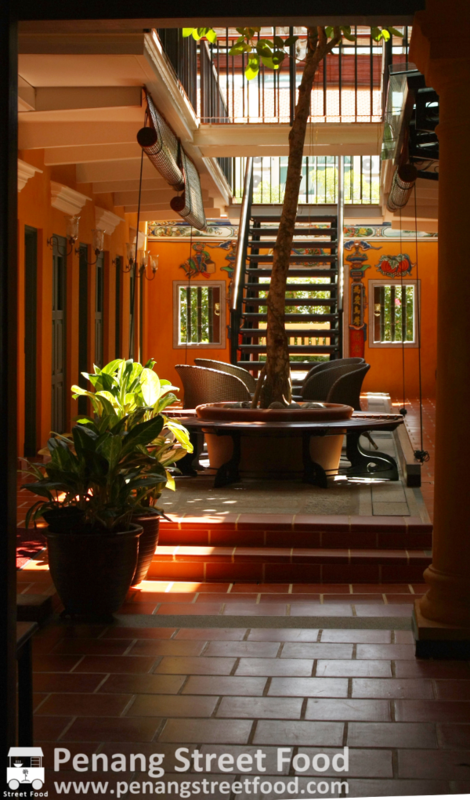 The courtyard has a quiet ambiance and the hotel now boasts a new swimming pool. Read more about Yeng Keng Hotel here. Bless Mr. Mook, we found the Ki Ya Kueh along Jalan Kuala Kangsar behind the Chowrasta market. Yay, another one off the list! These yellow and green kueh, reminiscent of the colours of Brazil, is made of rice flour and lye water (an alkaline chemical) to impart a springy texture to the kueh. The green version is essentially a pandan flavoured option. The brown syrup is made from palm sugar, which gives the kueh its sweetness as on its own Ki Ya Kueh is pretty mild tasting. 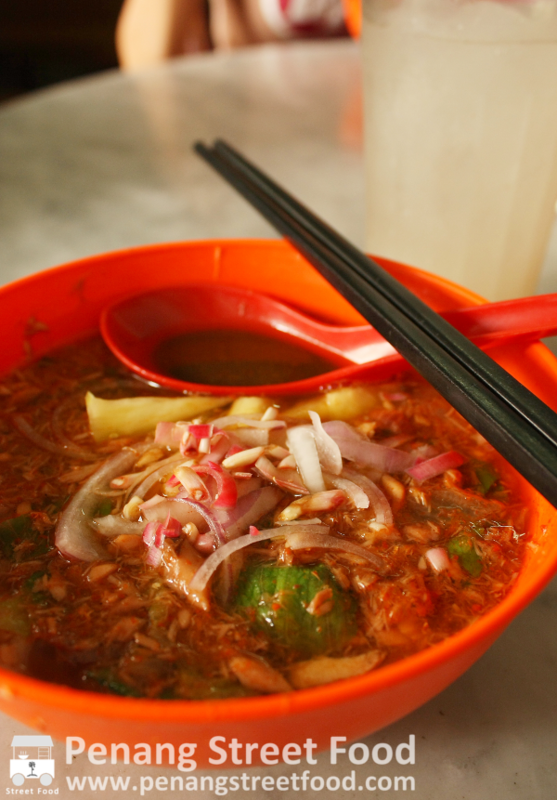 Happy with the outcome of the kueh hunt, we headed next to Penang Road to check another wanna eat item off our list… Assam Laksa. Honestly, I cannot say that I have ever tried the Assam Laksa at Joo Hooi Cafe before this. However, as Ms. Purple Hat was waxing lyrical about how this was the perennial Assam Laksa stop for her when she’s in town, I had to give it a go. Of course, Joo Hooi being next to the famous Teo Chew Chendul also helped sway the decision as well. 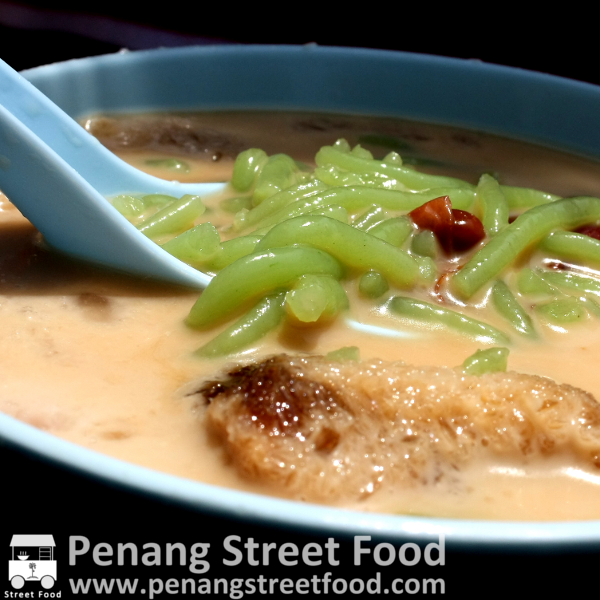 Tip : If you must have the famous Chendol and do not want to pay any additional “taxes” have it alfresco, i.e. standing next to the Chendol stall outside Joo Hooi. The coffee shop proprietors will charge an extra RM0.50 if you are to consume the Chendol in their premises. Alternatively, ask the Chendol stall vendor to show you to their own shoplot, which is a stone’s throw away. The Assam Laksa was really fragrant and certainly got us all salivating. It was certainly a respectable effort – my only wish was that it was “thicker” with more fish bits in it. Ms. Ki Ya jokingly recommended that I put my tissue paper into the soup to get it to the consistency that I wanted. The joke is a reference to the urban legend that some of the famous Assam Laksa hawkers use to thicken their Assam Laksa broth with tissue paper (instead of more mackerel) to save costs…unproven so far. With our thirst quenched by the lovely Chendol and our tummies warm from the spicy Assam Laksa, we proceeded to the next non-food attraction, the Straits Collection on Stewart Lane as part of our informal heritage hotel tour. Opened this year, the Straits Collection on Stewart Lane is a row of shop houses built in 1927 in Straits Eclectic style. Having been exposed to the unique architecture of these prewar shop houses as a kid in my grandfather’s Rope Walk premises, I thought I’d inspire my friends (who are all from the construction industry) with the recent revival of interest in these heritage buildings. 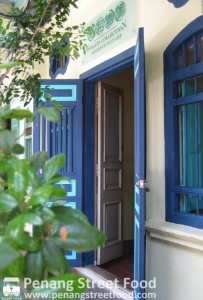 Typical of prewar shop houses, they have really long dimensions as compared to the narrow frontage and an airwell to promote good air circulation inside the shop house. The hotel – run by Bon Ton Group – certainly managed to keep to the traditional style when refurbishing and fitting out the residences and public areas of the hotel. Unfortunately for us, all the rooms were occupied for the period and we had to make do visiting the public areas of the hotel, specifically the Reading Room and Kopi Cine. The Reading Room had a nice collection of coffee table books about Penang. 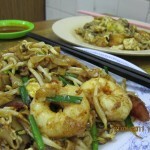 The adjoining shop house where Kopi Cine is located was doing bustling business with all tables occupied. Their menu of a fusion of Western (Smoked Salmon Bruschetta RM 14, Lamb Sausages with Mash Potatoes RM 32) and Eastern (BBQ Chicken Tikka RM 32, Crispy Aromatic Duck with Crepes RM 34) looked pretty interesting. A little disappointed that we were not able to check out the interior of the suites, we adjourned to the next item on our heritage tour that was a guaranteed entry i.e. 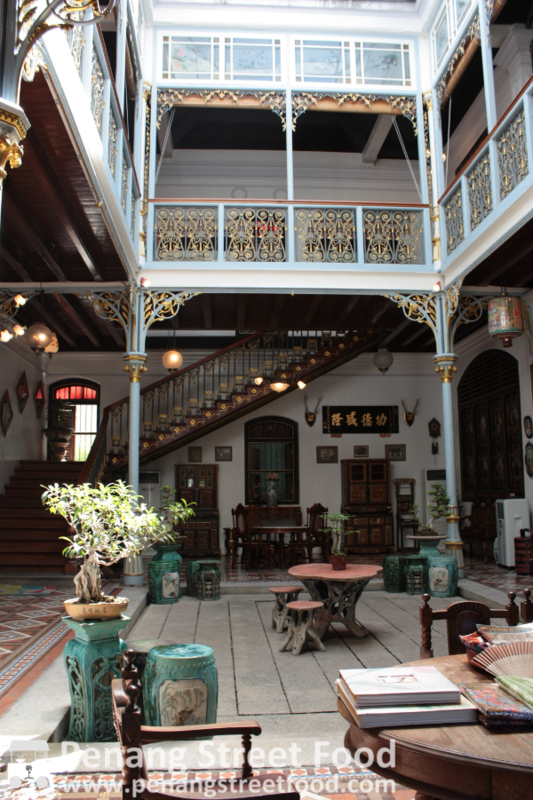 the Pinang Peranakan Mansion on Church Street. In my opinion, this tourist attraction is a must visit for anyone who wants to have an eye-opening glimpse of the lifestyles of the rich and famous during the Straits Chinese Golden Era. All manner of Nyonya antiques are displayed from priceless porcelains, to kerongsang (brooches) and baju kebaya (traditional dress of Straits Chinese ladies). 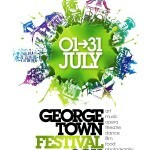 It is worth the entry ticket of RM 10 per adult to have a wander around the adjoining buildings that form the mansion. 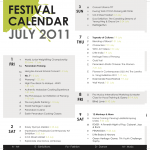 Visit http://www.pinangperanakanmansion.com.my/ for more information. Everyone that drives in Penang will tell you that traffic is bad. 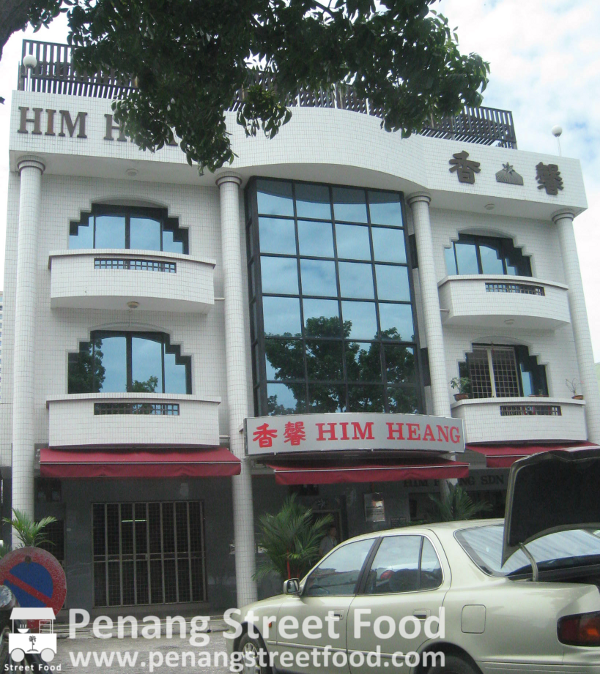 The traffic on Burma Road is made worse by the fact that Him Heang, the Tow Snar Pheah biscuit shop is located here. You can count the number of out of town cars that are illegally parked by the roadside to pop in quickly to Him Heang to pick up a box or three of the famous Tambun (Dragonball) Biscuits. So with a bunch of KL-ites in the car, Him Heang is a must visit outlet for edible gifts for the folks back home. Tip : There is usually a fresh batch of biscuits coming out of the oven at around 2.30 pm! For the uninitiated, Tow Sar Pneah and Tambun biscuit is made from mung bean, tastes slightly salty and is non-halal as it has lard within it. There are other varieties of biscuits at Him Heang as well, like the Beh Teh Saw and the Hneoh Pneah which has a sweet and gooey filling. 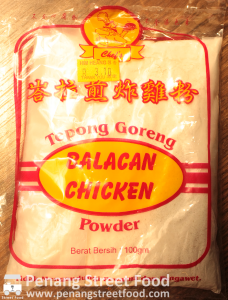 For me, what I like to stock up on when I do stop by here is the Belacan Fried Chicken Flour. At RM 3.10 per packet, it is a real party pleaser. All you need to do is add an egg and some oyster sauce to the flour, deep fry some chicken wings and…voila, great finger food for parties that even kids enjoy. The good thing is that the Belacan Flour has no colouring and preservatives, and keeps for years (purchased in 2010, expiry Dec 2013), which is important for occasional cooks like myself! To avoid disappointment and to save time, you can call ahead to make your order and pick it up later at 162-A Jalan Burma. Him Heang can be reached at this number : +604 - 228 6129. ….since i'm one good 50 yrs. resident at Perak Rd. its one of the oldest town in Penang. As early as 6am daily, the Perak Rd. morning market is already bustling with promising Hokkien Mee, Curry Mee, Char Koay Kak, Nyonya Kuih push carts by the veteran hawkers, and of course the 'non-stop frying once started' Char Koay Teow stall. As you walk along the market lay-bys, on the left, there is a young lady selling tangy & authentic 'Ki Ya Kuih' for just a dollar & it's a big piece. 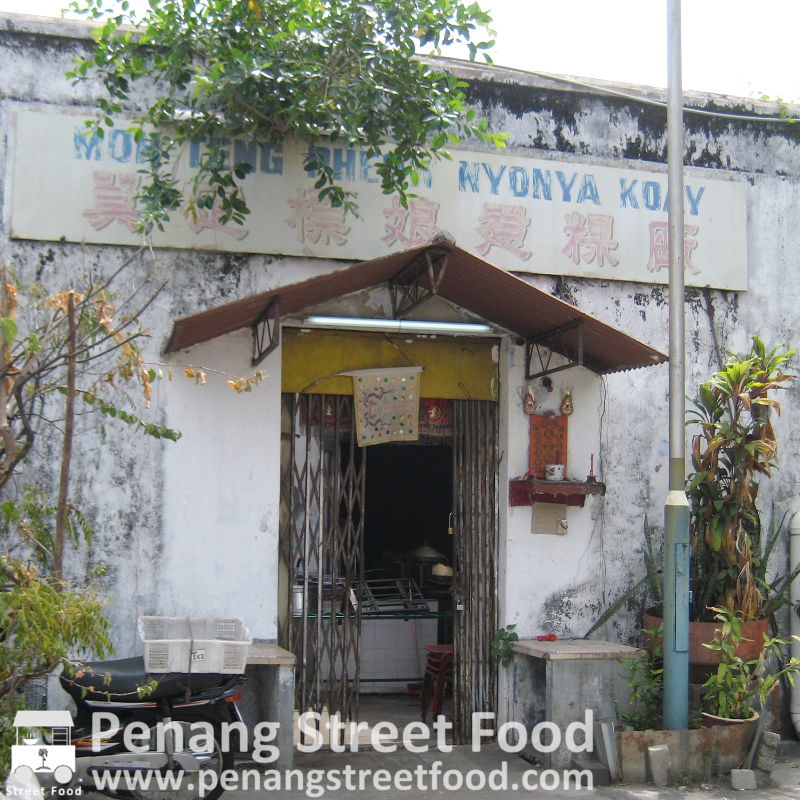 Don't miss a young man selling freshly make-behind stall Nyonya Kuihs. Eat them, you are sure to 'sapu' many more. 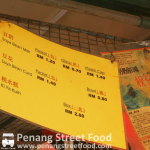 I recommend the 'Ben Cheng Kuih', ttoo. It taste better with brown sugar or with jagung wrapped in it. Or try it with an egg baked in.! 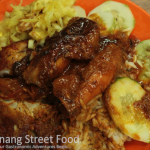 Cheers & eat while you can…don't forget to order Kopi Or Kiam Liau!